Form follows function with the crisp, understated design of the Park wardrobe and bedside tables. Visually simple, the mobile cabinet, bedside tables and wardrobe are free of embellishment. Park provides space for personal items and easy access to self-serve supplies. Open finger pulls are easy to grip, helping patients to reach their belongings. 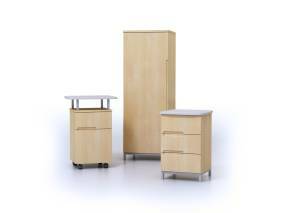 Available with one- or two-tone finish options, the Park collection features heavy-duty, solid-backed construction to withstand nonstopdemands in healthcare environments. The Park mobile cabinet includes a unique dual-tiered surface for belongings. Bedside tables area available with metal legs or casters for mobility. We can enhance the healthcare experience by enabling patients to take control of their journeys. Places to accommodate personal items, opportunities to self-serve, and clean, uncluttered settings can meet individual needs and provide peace of mind. For more product information about Park, please visit steelcase.com.